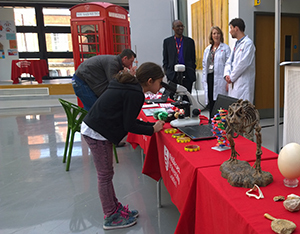 Young inventors of the future from across north London got a taste for science at Middlesex University. Hosted at the Hendon site, year six pupils from 26 primary schools took part in the Young Scientists competition on Saturday 14 March. The event formed part of British Science Week, a ten day celebration of the best of British science, technology, engineering and maths (STEM). Throughout the day, a total of 52 budding young scientists from across Barnet, Enfield, Brent and Harrow participated in a series of fun, interactive, engaging and educational activities based on product design engineering, computer science, biology and sports science. Parents and guardians were also able to take part in interactive science based demonstrations led by academic staff and students at the University. 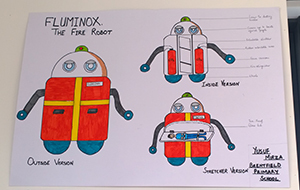 The 10 and 11 year olds were encouraged to design posters before the event, based on inventions they would most like to be see made. Some of the innovative designs included the Mo-Mouth Kleaner, an electronic mouth guard to clean your teeth, and The Portable Baby Scanner, a touchscreen laser scanner which can be carried anywhere to check on a baby's progress. University professors named Yusuf Mirza, from Brentfield Primary School, as this year's winner, after they saw his impressive Fluminox, a fire-extinguishing robot equipped with lasers to destroy hurdles, a camera eye to locate injured people and a built-in extendable stretcher. The bright youngsters were also given a glimpse behind the scenes on a campus tour with a scientific twist, exploring the facilities on offer, and picking up clues to answer science-related questions. Middlesex University Education Liaison and Outreach Manager Elita Eliades-Ahmed said: "STEM plays such a large part in our lives, and it was really interesting to see how students reacted when they realised how so much of what they use every day couldn't have been invented without science, technology, engineering and maths. "The students really used their imagination to come up with some fascinating and captivating inventions, which we would love to see made. "We hope hosting events such as this, places STEM at the forefront of children's minds, and inspires today's inventors of the future."